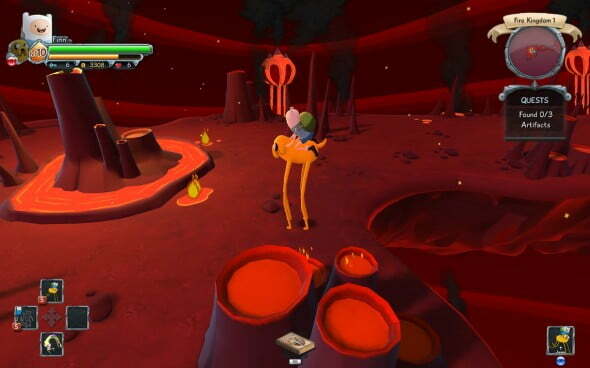 In Finn and Jake’s Epic Quest, the world of Ooo has been turned into a giant videogame. The question is, should you embark on such a quest? Read our full review and find out. I’m a huge fan of Adventure Time, as I’d need to be to truly appreciate a high quality licensed title. As a poor peasant boy without the funds to purchase most Nintendo hardware, my 3DS-less game library has been sorely missing any Adventure Time games, since most of them have been handheld exclusives. I was surprised, then, to hear of an Adventure Time game awaiting PC release, a platform which is rarely “graced” by the presence of tie-in games. Unfortunately, though the charm of the show naturally permeates through Finn and Jake’s Epic Quest, it lacks the inherent creativity and imagination it so desperately tries to recreate. Our premise is suitably loose and metatextual: the world of Ooo has been turned into a giant videogame, and each kingdom now represents a different Crash Bandicoot-esque elemental level. Finn and Jake are seemingly un-phased by these events, and set out to find BMO in order to set things straight. Story beats are fairly light and infrequent, though the few cut-scenes we do get are blessed by the presence of John DiMaggio and Jeremy Shada as our titular characters. From here, Finn and Jake’s Epic Quest starts out as it means to finish: as a simple Toe Jam and Earl style hack-and-slash adventure packed with fan service and bright colours. That’s not to say these elements don’t work at all – Epic Quest is a fairly solid, if a little meandering tie-in game – just that the game never transcends or equals the quality of Pen Ward’s show, and only ever succeeds when directly referencing it. Though Adventure Time’s world, characters, music and lore is heavily inspired by videogames, Epic Quest highlights one of the fundamental problems with making an Adventure Time game; action is rarely the best part of the show. Though the show’s hilariously oddball monster designs are all still present in Finn and Jake’s Epic Quest, fighting them is a surprisingly paint-by-numbers affair, and becomes stale rather quickly. 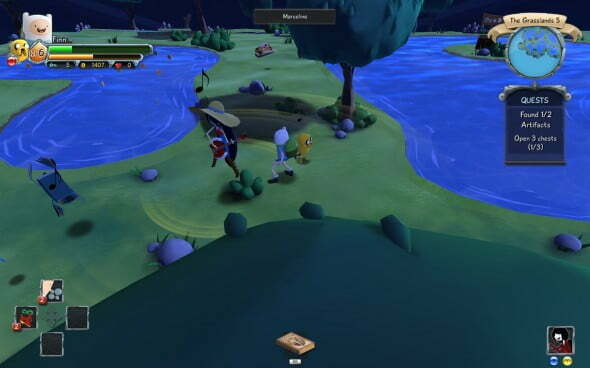 The player can tag between Finn and Jake to take on enemies, a concept which should open combat up to a realm of interesting combos and tag-attacks. 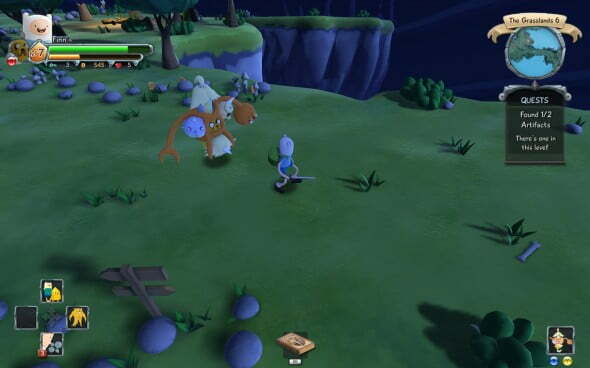 Instead, Finn can use his sword and can dodge, whereas Jake can use his fists and shapeshift his hand into a shield. 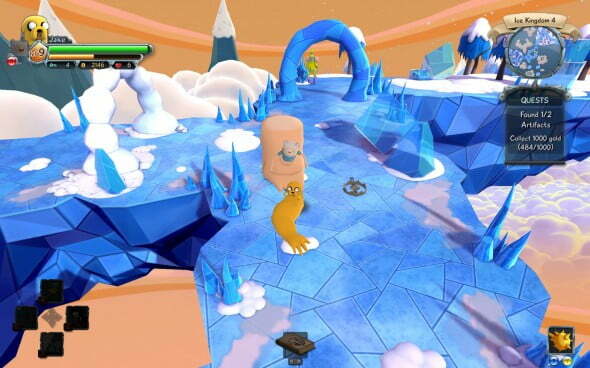 For a game that stars a magical shapeshifting dog, simply hitting people feels dull and a little frustrating. Outside of simply running around, bashing in the heads of Gunters and collecting coins, there’s little else to Epic Quest. Some enemies must be hit from behind, some are ranged, some are fast, some are strong etc. Everything feels uncomfortably predictable – too predictable for a world wherein Lemongrab can exist. I was rather hoping that after I’d finished the game’s opening level (a grass level, notorious for being boring and easy) the game would start to experiment with different mechanics and challenges befitting the designs of the later levels, but no such risks were taken. The ice kingdom only includes slip-and-slide mechanics or freezing/slowing effects when Finn and Jake fight the Ice King in the kingdom’s final stage. This sense of repetition is occasionally alleviated by random encounters (the Door Lord and Magic Man show up sometimes to cause welcome chaos) and the “Enchiridion” pages Finn and Jake can collect and use. These pages grant a range of time limited powers and abilities which will be familiar to fans of the show; there’s Jake armour, Marceline playing bass, Jakes’ kids, and even Fionna and Cake. They vary a great deal in their usefulness (there are one-hit-kill abilities and then there’s “Fancy Masks”) but most of them serve their purpose, they make you say: “Oh yeah, I remember that!” This is one of the game’s major pitfalls; it pays such homage to its source material that it often simply feels like a re-hash of Adventure Time’s greatest hits. Where Epic Quest tries to bring in new ideas, it comes up unfortunately short. There are meta-jokes about being inside a videogame, but most of them are fairly lazy and exist only to excuse monotonous gameplay. If you mock silly videogame logic and then include it in your game, you’re not really making a joke, you’re just doing the thing you made fun of. The guest characters that show up are also sorely lacking their respective voice actors, making their text-only dialogue about a tenth as funny as it could be were it delivered by Tom Kenny or Hynden Walch. Even the funniest of sound bites (“Mo money, Mo problems!”) become repetitive once you’ve heard them ten times over, a problem most tie-in games tend to have. The game’s soundtrack features suitably chirpy chiptune songs, and though Epic Quest is still plagued by the classic “2-D characters look super weird in 3-D” issue found in The Simpsons or Family Guy games, there’s enough outrageous colour and sparkle for everything to fit Adventure Time’s cheery, fantastical tone. Finn and Jake’s Epic Quest is never particularly bad, it just never soars above predictable and average. You hack-and-slash your way through uneventful if inoffensive combat with familiar faces, Finn and Jake make the occasional chuckle-worthy quip, and you grind your way through cut-and-paste levels with elemental re-skins. It actually provoked very little emotion out of me, bar a lingering sadness and a desire to go back and watch Adventure Time. Since Finn and Jake‘s Epic Quest is cheap on Steam, I figured it at least wouldn’t dent anyone’s savings. That is, until towards the end of my writing this review I found out that the entire game is simply a slightly upscaled version of a game you can play for free on the Cartoon Network website with Unity. Suddenly, the unambitious and lacklustre nature of this less than epic quest made complete sense. Dull, repetitive combat is occasionally spiced up by familiar favourites, but Finn and Jake's Epic Quest is little more than a tour of Adventure Time's history. The Land of Ooo has no business being so average.